Every summer our little Creston Valley welcomes hundreds of cherry pickers to harvest our fruit orchards. Persons come from all walks of life and various countries. An incredible mosaic of people come together to share in a feast. All time and food is given freely in love. Areas to serve at this event? 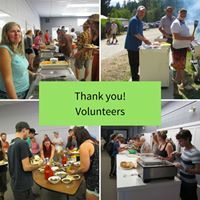 Here are just a few ways to get involved: Set up, tear down, serving food, cleaning up, and mingling with our guests. It’s an all hands on deck day and there are jobs from 10:30am till 4pm. This opportunity comes once a year! Don’t miss out on your turn to share God’s love and kindness to our Valley pickers.